The Versatool is a handy little screwdriver bit set with a unique multi-position drive handle. The handle provides different amounts of grip and torque. The entire package is about as small as it could possibly be. It fits easily in any shirt or jacket pocket or a Sportbike seat. 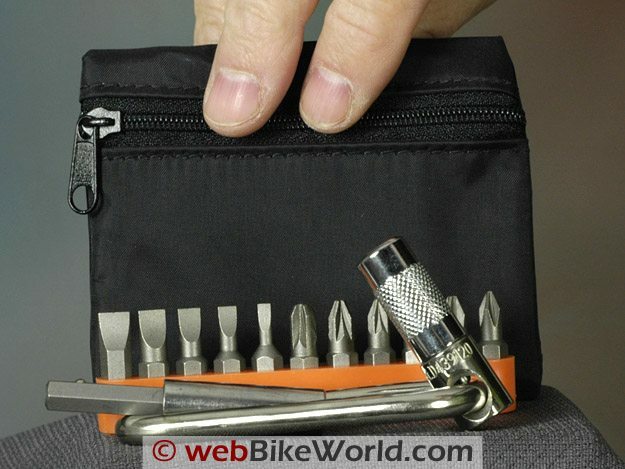 It’s been over a year since my last webBikeWorld motorcycle tool reviews, which looked at two different miniature tool sets, the GearRatchet Vortex Ratchet Set (review) and the Stubby Screwdriver set (review). I’ve been obsessed since then with finding more miniature-but-useful tool sets for my collection, like the Fenix E01 LED flashlight (review) I also discovered recently. My criteria include small or pocket size; light weight; low cost; and high quality. And yes — it definitely helps if the tool set can also be used for working on a motorcycle! During my search, a friend told me about a screwdriver kit called the “Versatool” or the “Versadriver”, the subject of this review. It definitely meets all my criteria, and it’s also useful both on and off the bike. You’d need a couple more tools to rebuild, say, a Norton Fastback, but the Versadriver is very handy nonetheless. The first trick was finding one of these Versatool screwdriver sets. I realized there is some confusion over the correct name of this tool. First of all, the name “Versadriver” is pretty popular and it’s used by more than one manufacturer (trademark dispute anyone?). Also, these brand names are used by different companies for completely different products. For example, there’s the DuraPro VersaDriver ratcheting screwdriver handle and the SnapOn VersaDriver impact wrench. There’s the Versa Tool wood cutting saw guide holder and the Versa Tool knife set and holder. And don’t forget the Versa-Tool 950 degree F wood burning etching tool…and probably a half-dozen more . And we’re still not to our Versatool screwdriver set. I looked around for a Versadriver and found one just by chance. When it arrived, it was in the plain black zip-up bag shown in the photos and completely absent any branding information. I wanted to know who makes this tool, but finding the information was going to require the little grey cells of M. Poirot, until I noticed some engraving on the 1/4″ drive square head of the tool. It is inscribed “Doc.Allen us pat.D439120”. It is engraved exactly like that, including an errant quote mark before the Doc.Allen. Doc Allen — there’s a clue! As soon as I searched on “Doc.Allen”, I found it. Once I got that sorted out, I can now let it be it known that this product is officially called “Doc Allen’s Versatool”. It’s “The Swiss Army Knife of Hand Tools”, according to The Doc. The Swiss Army Knife reference surely must be another trademark dispute in the making, but I’ll leave that one up to the lawyers. Doc Allen — whoever he or she is — sells the tool for a very reasonable $12.95 USD. The Versadriver version shown here was purchased from County Comm, a sort of survivalist/police store that sells everything from watch straps to survival candles. The Versadriver shown here is nearly identical to the Doc Allen original, with a few exceptions. First, this one did not come in a blister pack (thus the mystery on where it was made). Second, the little tool bag it came with does not have the Doc Allen logo. And third, this one also includes a 2″ long, 1/4″ drive extension that is missing from the Doc Allen original, for some reason. Versatool handle positions, L to R: Folded, low torque, medium torque, high torque. Now that my extended intro is complete, with probably way more background information than you wanted to know, let’s take a look. Aa set of 11 standard 1/4″ drive hex bits (Phillips 1, 2 and 3). Pozidriv 1, 2 and 3. Flat hollow-ground screwdriver bits 3, 4, 5, 6 and 7. The bits that come with the Versatool seem to be the higher quality type, about like you’d find with a good brand-name tool set. One of the good ideas used by Doc Allen is the use of the standardized 1/4″ drive bits. Don’t like the Pozidriv selection? Need a bigger selection? No problem, simply add your own. The little plastic holder included with the Versatool holds 11 bits, but you can fit many more in the pouch if you’d like, or buy a tin of Altoids and use it to hold more 1/4″ drive bits than you’ll ever need (eat the mints first). 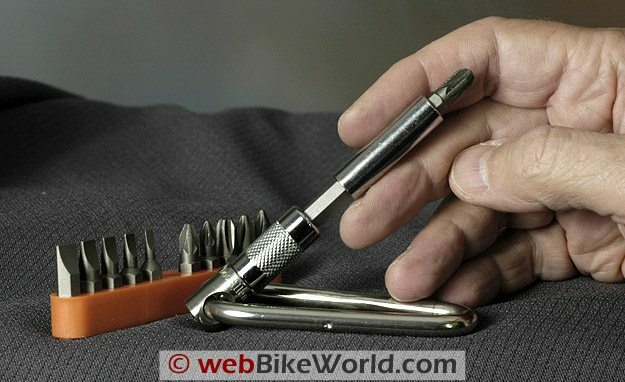 Or get a specialized Wiha Tools bit holder (review). But the most unique Versatool feature is the tool itself. It looks somewhat like a carabiner but it has a 1/4″ drive tool head attached to the loop. The tool driver head slides all around the looped carabiner and it can be placed anywhere along the loop; the location defines the amount of torque the user can apply. The tool has 4 positions: Fold the tool head inside the loop for storage; to the large end for low torque; to the middle of the loop for medium torque; and slide it to the narrow side for highest torque. Of course, “low”, “medium” and “high” are relative terms, because the ersatool is designed for hand use only. In fact, the Versatool was originally designed for bicyclists, and bicycles certainly don’t need the power of a 1/2″ torque wrench. The Versatool also comes with a separate 1/4″ drive hex driver that can be attached to the driver, but is really designed to be used with the fingers for even lower torque. Pop a 1/4″ drive bit into the holder and you’re ready to go. And finally, the County Comm Versadriver version also comes with a 2″ extension, which is very handy and, I think, a vital part of the system. I’m not sure why it doesn’t come with the Doc Allen version of the Versatool. The carrying bag feels like nylon. It’s basic quality, nothing fancy. It has a “GEM” labeled zipper and it has a belt loop sewn on to the back. The loop is made from woven nylon ballistic-type material. When the Versatool parts are packed in the bag, the entire package is about 10 mm thick by 57 mm tall by about 100 mm wide. It fits easily into a shirt pocket or one of the smaller pockets on a motorcycle jacket, or by using the built-in belt loop. The tool is very easy to use, and the design of the multi-choice torque handle actually seems to give better grip with less chance of slipping than a regular screwdriver. It’s easy to move the head to any of the desired torque positions or anything in between. I also think that because I can keep the tool closer to the screw, rather than having my hand farther away like it is when I’m using a long screwdriver, I feel like I have better control and feel for how much torque I’m applying to the fastener. The tool is chrome plated and it really does seem like it’s all pretty high-quality stuff. This is not a cheaply made tool set by any means; just a simple, ingenious device that fits in a minimal amount of space and basically does everything a large screwdriver set can do. The Versatool (aka Versadriver) kit is a very handy little tool kit that actually works very well. It’s a solid kit that feels well made and seems well worth the 12 bucks or so that it costs to buy it. And it has to be one of the “smallest full size” tool sets ever made! From “R.G.” (9/09): “I recently won one of these at a contest and I absolutely love it. It’s so nice and compact but functional, it’s basically my new toolkit on my Hawk. I purchased a socket driver set from Lowes that has SAE and Metric sockets with an adapter that fits the Versatool. So I now have a complete mini-toolkit that takes up about 1/4th the size of other toolkits I’ve bought or made. While I wouldn’t use it to do a rebuild, or if I was at home with access to a full toolbox, it’s perfect for on a ride when you just need to tighten or loosen or adjust something.